Tag Archive for "australia vacation spots"
Rich in history, incredible food, creative locals and smooth whiskies to warm you from the chill of mountain air – this is Hobart. It’s the capital of Tasmania, Australia’s island state, located about one hour’s flight away from Melbourne. 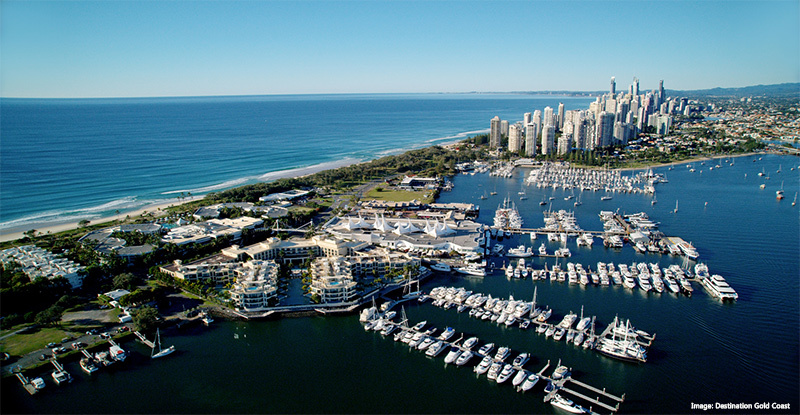 Its blend of strong heritage and waterfront charm make it popular for travelers looking for a laid-back destination that has it all. From one-of-a-kind museums to great hikes, native wildlife and haunting historic sites, Hobart has something for everyone. Here’s our list of 9 amazing things to do in Hobart for the best vacation in Tasmania. Get ready for a reawakened passion for food. 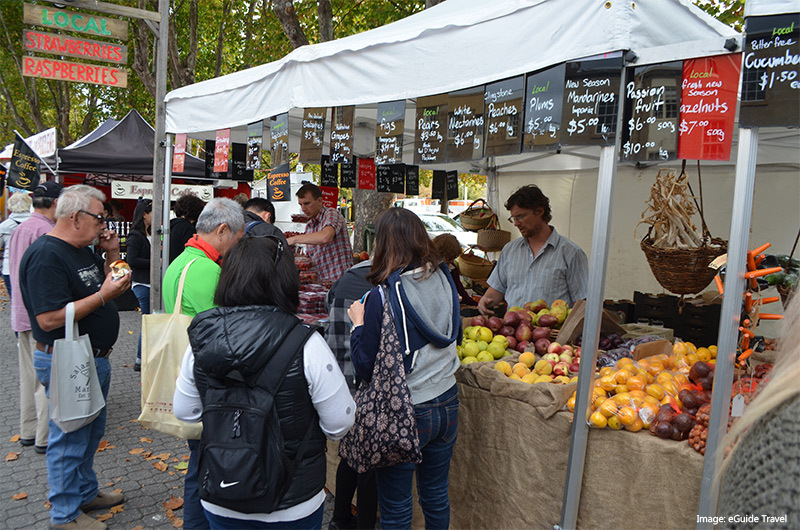 At Salamanca Market, a simple stroll is impossible without the urge to taste your way through its stalls. 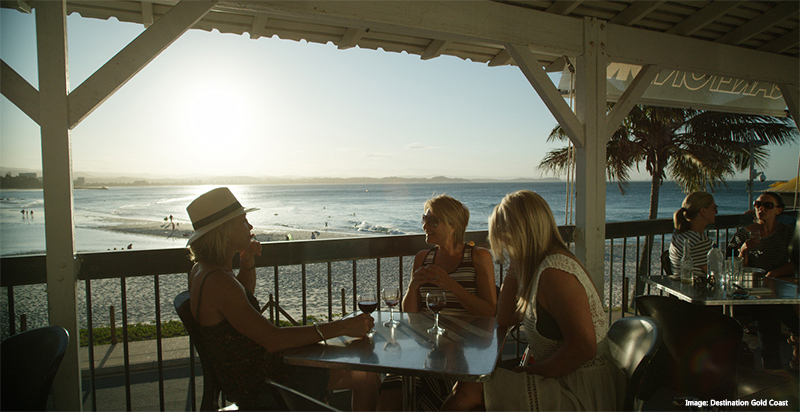 You’ll find wallaby burritos, salmon sausage and fresh scallop pies among other gourmet artisan food. Sample local honey, sip on locally distilled gin or whisky, and admire leather goods – every stall boasts finely made products with an emphasis on local. Another favorite stop is at the wood work stalls, where you’ll find an array of impressive crafts made from Tasmanian timber. Along with the bustle of local musicians lending their talents to the crowd, the inviting atmosphere alone makes Salamanca Market worth it. Located near at historic Salamanca Place next to the Hobart waterfront, the market is only open on Saturdays from 8:30am to 3pm. Known as Hobart’s eccentric child, the Museum of Old and New Art (MONA) sets out to challenge perceptions of art. Some liken MONA to Vegemite – you’ll either love it or you’ll hate it. But one thing is for sure about this controversial museum – you’ll never forget it. The museum itself is considered an interactive piece. With artful architecture and winding staircases jutting out in every direction, the setting is perfect to lose yourself in a world of conceptual art and ideas. Here, owner David Walsh displays his extensive private collection of modern art and antiquities. You’ll find pieces ranging from a waterfall installation cascading words to confronting exhibits on human anatomy. MONA invites you to form your own opinion with its ‘O’ device. Provided to all visitors, the O offers artist interviews, self-proclaimed ramblings from David Walsh, and information on each exhibit as they are encountered. On the ‘O’ you’ll see an option to either “Love” or “Hate” each piece, letting you know how many other people agree with you after submitting your answer. At MONA, there are no wrong opinions. Many warn that this museum is not for the faint of heart, but all you really need is an open mind. Indeed, that’s often the source of the most rewarding experiences. Slip into a sweater and head to kunanyi / Mount Wellington for the best views over Hobart. No, that’s not a typo – the official name of Mount Wellington incorporates its Palawa kani name from the languages of Aboriginal Tasmanians, using no capital letters. As part of Wellington Park, the many walking tracks, mountain biking trails and even rock climbing easily make for a whole day exploring the mountain. Climb to the summit and take a break from the wind in the Pinnacle observation shelter. With tall glass walls overlooking Hobart, the expansive view will leave you breathless. Get an even closer look on the Pinnacle boardwalk observation deck and take in the inspiring view with the breeze of cool, mountain air. Make a stop at the Lost Freight Cafe on the way down. This charming cafe fitted out of a shipping container serves up some of the best coffee in all of Hobart, along with a savory rosemary lamb pie and other hearty treats. As Australia’s second oldest capital city after Sydney, Hobart is full of historic sites with turbulent pasts. One of the city’s most significant sites is Cascades Female Factory, lying in the shadow of kunanyi / Mount Wellington. This historic purpose-built institution incarcerated thousands of children and female convicts of yesteryear. Plaques detailing the history of this site hang along the walls of the restored ruins. Tours are also available, led by knowledgeable and passionate guides. A must-do experience, however, is the “Her Story” dramatization of the Female Factory’s past. You’ll relive the history as you follow the story of one woman’s experience in the institute, complete with transparent depictions of the harsh treatment endured by these women. Crafted with pure Tasmanian water sourced straight from kunanyi / Mount Wellington and Tasmanian-grown hops, Cascade Brewery does beer best. Established in 1824 and still in regular operation to this day, this is Australia’s oldest working brewery. Not even a fire can bring this Tasmanian icon down – after a great bushfire devastated southern Tasmania and Cascade in 1967, the people of Hobart joined together to rebuild the brewery. The result is not only a flagship of rich Tasmanian beer but also a testament to the resilience of Tasmania’s people. Get a taste of the Cascade Pale Ale, the oldest continuously brewed beer in the country. The smooth and rich Cascade Stout is sure to hit the spot for stout drinkers. Or try a brew available only in Tasmania – the Cascade Lager. The ornate gothic facade of the brewery and its splendid gardens are inviting enough to spend a day out on the grounds. Grab lunch at the onsite restaurant with a generous menu featuring locally sourced produce. Opt for a tour of the brewery for a timeline of Cascade’s history along with a look behind the scenes of the brewing process. Just be sure to wear pants and closed-toe shoes! Bonorong prides itself as a small business with a huge heart. As a 24/7 wildlife rescue service, we’re inclined to agree. The sanctuary’s aim is to nurse animals back to health and into the wild. Run by volunteers and housing species extinct everywhere in the world but Tasmania, Bonorong is truly special. Here you’ll meet native wildlife such as kangaroos, koalas and wombats along with the Tassie favorite – Tasmanian devils. From feeding frenzies to personal encounters, the wildlife experiences are intimate, fun and unforgettable. Get up close with Tassie devils and have a “tug of war” with them for their dinner. Hand-feed adorable Eastern quolls, tawny frogmouth owls and sugar gliders. Want to see it all? 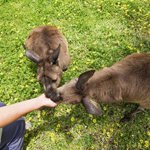 Join a sanctuary tour, where you’ll receive a bag of kangaroo food to hand-feed the kangaroos roaming freely on the grounds. Located just about half an hour from Hobart’s city center, Bonorong makes for a great day trip. There’s no better place to immerse yourself in Tasmania’s history than at the Tasmanian Museum and Art Gallery. Though not large, you’ll easily find yourself lost within the rich stories and history behind the exhibits. 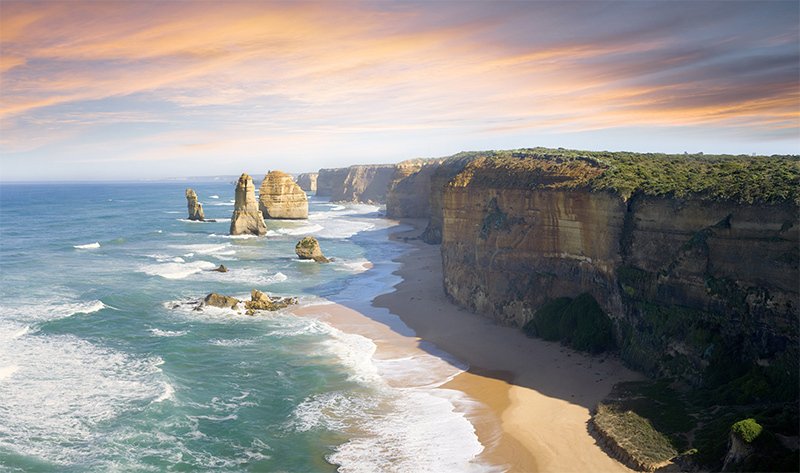 Marvel at ancient Tasmanian artifacts and early settlement relics. Learn about the poignant Black War of the 1820s and Aboriginal culture with dedicated galleries. You’ll also find a fabulous coin collection and fine Australian paintings. Crowd favorites include the Tasmanian devil exhibit with an extensive history of the animal. You’ll even learn how it came to feature as a character on the Bugs Bunny cartoon! The museum star, however, is its thylacine exhibit, showcasing this infamously extinct animal. Not one to shy from Tasmania’s turbulent history, the objective portrayals this museum employs is truly a refreshing experience. Escape into tranquility at the Royal Tasmanian Botanical Gardens, showcasing flora from Australia, New Zealand and even Sub Antarctic species. 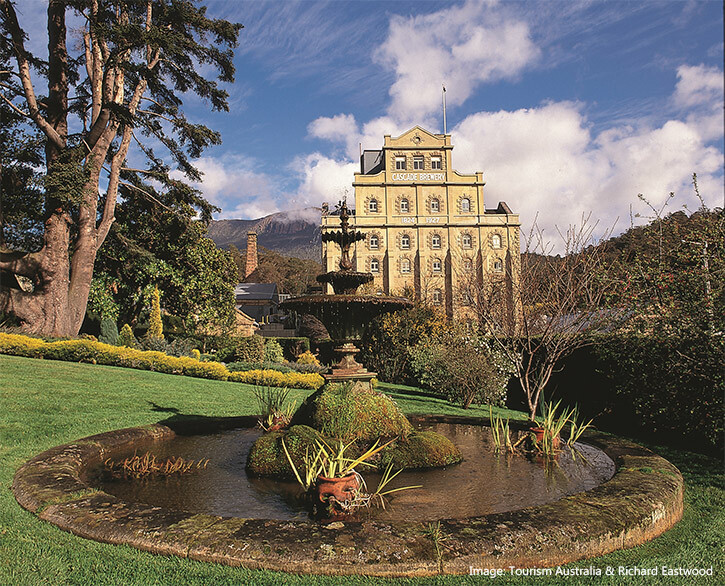 Established in 1818, these are Australia’s second-oldest gardens – another historic landmark for Hobart. Stroll through cheerful fruit and vegetable patches, charming succulents and other interesting native plants. Explore the secretive nooks and crannies, enshrouded in flowering plants and blooms. Make your way to the Japanese Garden for true serenity, complete with a tranquil brook under a bright red bridge. Stop by the Sub Antarctic Plant House for one of the gardens’ most exciting and unusual collections. Here you’ll find plants from Sub Antarctic islands in a climate-controlled complex complete with chilly fogs and mists. Our favorite way to visit the Gardens is on a small group city tour of Hobart highlights. 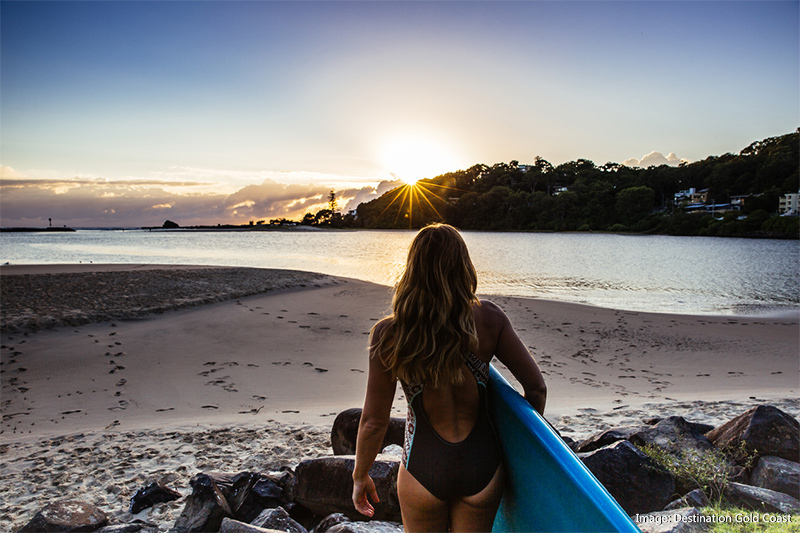 Delight your senses on a Bruny Island Traveler tour for a taste of Tasmania’s gourmet food and goods. A popular day trip from Hobart, Bruny Island lies less than two hours away from the city. That’s a small journey for some of Tasmania’s most delectable treats. Every stop on your journey is a course on your menu for the day. You’ll taste savory artisan cheeses from Bruny Island Cheese Company, freshly caught oysters at Get Shucked Oysters, hand-crafted spirits at Bruny Island House of Whisky and much more. More of a sweet tooth? You’ll also get a taste of sweet berry treats, premium chocolate and honey throughout your journey. Our tip is to skip dinner the night before the tour! Looking for More Things to Do in Hobart? Hobart appears a tranquil refuge at distance, but a closer look reveals a city rich in history, culture and experiences. As experts in Australia travel, we’ll give you the best tips and sightseeing recommendations for your stay in Hobart. Want to include Hobart on your next Australia vacation? Let’s start planning your journey today! As Australia’s second largest city and capital for all things food, music and fun, the list of things to do in Melbourne is endless. From its vibrant local music and arts scene to diverse food and incredible coffee culture, ticking off the essential Melbourne experiences in just a few days may seem impossible. That’s why we’ve made it easy for you. Here are 19 free things to do in Melbourne. What better way to see the city sights than for free? How about surrounded in the charm of a vintage cable car? And the best part – you can hop off and explore on your own, whenever you like. Running through the city’s central business district (CBD), the City Circle Tram is undoubtedly one of the best ways to see Melbourne’s main landmarks and attractions. 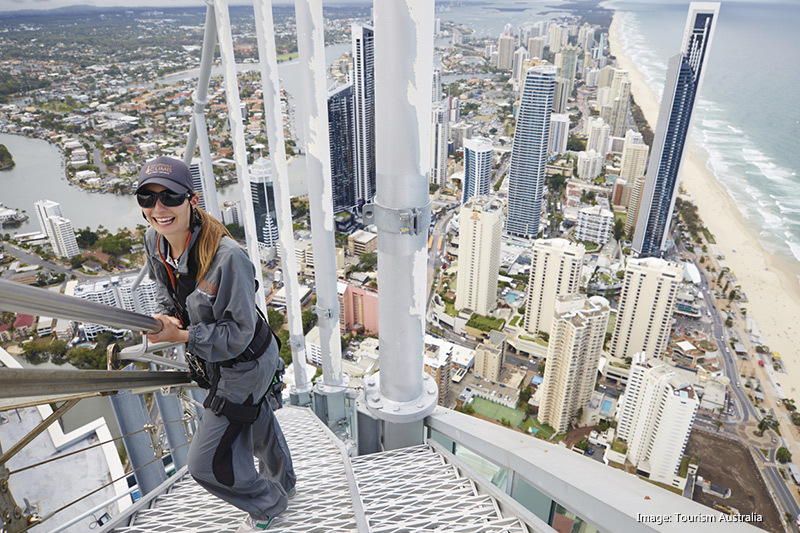 You’ll catch sight of the Melbourne Museum, Federation Square, Melbourne Aquarium and much more. The accompanying commentary will give you a rundown of each landmark and its history. Melbourne’s Queen Victoria Market is worth exploring just for the sights alone. The range of fresh produce and handmade products include everything from fruits and vegetables to hand-made pasta and top grade Wagyu beef. For something sweet you’ll find fluffy bubble waffle cones loaded with ice cream and Melbourne’s best American-style jam doughnuts. Forgot to pack enough clothes for your trip? Find a new favorite outfit within the racks of threads ranging from fine merino wool knits to neon yellow safety jackets. You’ll also discover unique treasures such as 1970’s comic books and vintage records – there’s something for every taste! Consistently rated as one of the top free things to do in Melbourne, the National Gallery of Victoria will impress even the non-art buffs. Wander among impressionist masterpieces from Monet and antiquities from all parts of the world. Immerse yourself in the vibrant colors and thought-provoking pieces of its contemporary art collection. 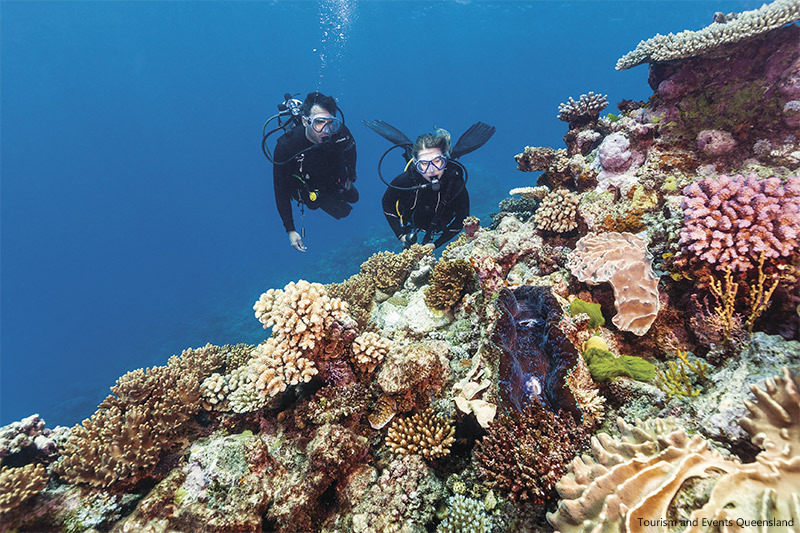 You could spend your whole day exploring the treasures within – and still feel like it’s not enough time! Melbourne’s inner-city grid lends itself to many hidden laneways that are easy to miss. But exploring these eclectic laneways in the CBD is one of the best things to do in Melbourne. You’ll find cozy coffee shops, warm cafes and bars where the soup of the day is gin. But the true gems will be the vibrant street art decorating the walls of these lanes. Take a walk down Hosier Lane to see some of the city’s best street art. You’ll see colorful graffiti masterpieces and artists working on new pieces. This iconic laneway is part of the heart and soul of Melbourne’s urban subculture – you’ll feel like one of the cool kids as you walk down the street. With less foot traffic, AC/DC Lane and Duckboard Place are also popular spots full of highly skilled street art. You’ll find a rock ‘n roll theme throughout AC/DC Lane, with murals of AC/DC band members (how the lane got its name) and other popular rock bands. Duckboard Place has a more gritty, urban aura with some hidden gems worth a look – easier to do with the least amount of crowds compared to other lanes. Melbourne loves its stand-up comedy nights. If you’re looking for something a little different on a night out, catch a stand-up comedy night for a round of laughs to go with your drinks. 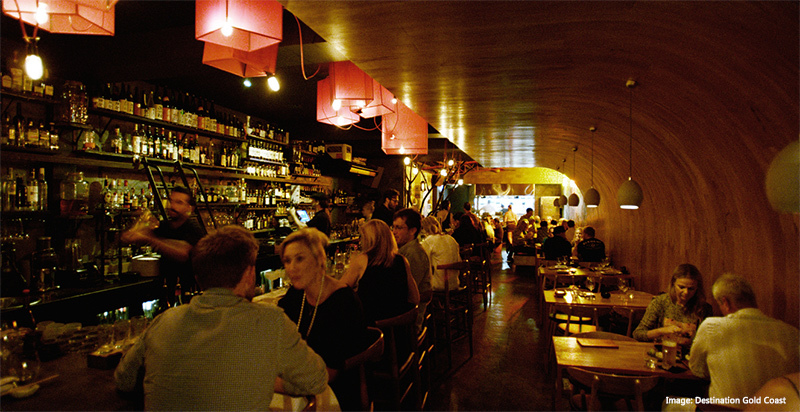 Spleen Bar on Bourke Street is a local favorite for its free comedy nights on Monday. Lido Cinemas offers free comedy nights on Tuesdays, featuring some of the best rising stars of Aussie comedy. Perhaps the free popcorn makes the audience a bit more sympathetic as well! For great vibes, cheap pints and one of the best comedy nights within the CBD, wander into Crab Lab on a Wednesday night. Grab some free popcorn and settle in for a great evening. George’s Bar – If you’re a fan of Seinfeld, you’ll love this George Costanza-themed bar in the Fitzroy district. You’ll love their free Thursday comedy nights even more. For the culture vultures lacking a little in the Australian art department, this gallery is a must. Part of the National Gallery of Victoria, the Ian Potter Centre focuses exclusively on Australian and indigenous art. You’ll see a representation of Australia’s history through artworks from aboriginal cultures as well as noted contemporary artists. Join a free guided tour to enjoy an expert’s insight into the exhibitions on display. Although the Australian Centre for Contemporary Art is small, the true modern art lover will feel right at home. The building itself is an architectural artwork hinting at the eclectic collection within. The constantly rotating exhibitions, workshops and films will challenge your perceptions and leave you with new perspectives. Let your inner obsession with television and video games run wild at the Australian Centre for the Moving Arts. Their Screen Worlds exhibition is a fabulous collection of interactive displays, history of cinema, video games and more. Here you can create your very own flip book or try your hand at editing film. Unwind with one of many educational yet fun video games and favorites including Mario Kart or immerse yourself in a virtual reality experience. The nostalgia and wonder will wash over you as your inner kid takes over. The Eureka Skydeck is one of the best ways to see Melbourne from incredible heights, however you can catch some amazing views of the city from rooftop bars for free. Though you may be obligated to order a drink, what better way to see the city lights as the sun sets than sipping on your favorite cocktail? Check out Swanson Street’s Rooftop Bar & Cinema or Lui Bar in Collins Street for unbeatable views and an outstanding range of drinks. As if Melbourne isn’t already cool enough, it’s also slated as Australia’s music capital. The city’s more than 400 venues have hosted major international bands acts as well as diverse local talent. You’ll find disco nights, classical music concerts, jazz gigs, metal rock bands, hip hop acts – whatever your taste in music, Melbourne’s got it. Live music is also easily found almost everywhere you turn in the CBD. Wander down AC/DC Lane and hit up Cherry Bar, infamous as a rock venue with a mix of free and paid shows. On Mondays the Northcote Social Club hosts Monday Night Mass, a free event showcasing some of the local music scene’s underground talent. The Gasometer Hotel is also a popular favorite in the local music scene, frequently hosting free shows on Sundays. The State Library of Victoria is a bookworm’s paradise – and a must even for those not into reading. Noted for its regal neoclassical architecture, the library contains six floors with a wonderful dome viewing balcony at the very top. Levels 4 and 5 are dedicated gallery and exhibition spaces, housing significant collections of Victorian artwork, writings and artifacts. You’ll find rare treasures such as a 4000-year-old Sumerian cuneiform tax receipt and the bullet-dented armor of Ned Kelly, Australia’s own Jesse James. Take a free tour to discover everything this iconic library has to offer. And enjoy the free WiFi, too – another great perk! If there’s just one thing to take away from your visit to Melbourne, it’s the city’s incredible coffee scene. You won’t settle for regular drip coffee after a cup of joe from one of Melbourne’s sensational cafes. The best way to get a taste of Melbourne’s greatest coffee is at Proud Mary, considered as one of the city’s finest coffee establishments. On Saturday mornings they have a free cupping event where all are welcome to meet their crew and taste new and favorite house blends. Enjoy a tranquil afternoon away from the hustle and bustle of the city at the Royal Botanic Gardens. The gardens sprawl across 94 acres of grassy hills, native and exotic plants, scenic walking trails and a creek, all surrounding a lake in the center. Free guided tours can help you get started exploring the vast gardens, or simply pack a picnic and relax by the lake. You’re very likely to spot native wildlife roaming around, especially the curious purple swamphen! Besides the Royal Botanic Gardens, Melbourne is blessed with many more beautiful gardens and parklands. At the top of the list is Fitzroy Gardens, a quiet retreat on the edge of the CBD. The lush trees, flowers and fountains give way to historic gems throughout the gardens. In the center of the grounds you’ll see a tiny Tudor village, like something out of a fairytale. Right next to it is Fairies’ Tree, a centuries old tree stump embellished with carvings of fairies, pixies, kangaroos and emus. Another gem is Cook’s Cottage, the historic home of Captain James Cook, the British explorer who first voyaged to Australia and the South Pacific. Though there is a fee to enter the cottage-turned-museum, seeing the cottage alone is undeniably cool. This historic landmark is a war memorial originally honoring the men and women of the state of Victoria who served in World War I. Now it honors all Australians who have served in war. A walk up the steps of the Shrine of Remembrance is a moving experience in itself. The shrine is designed in a classical style, inspired by the architecture of Athens’ Parthenon. What makes this memorial a special architectural gem is the planned, uninterrupted vista of the city from the top deck of the shrine. Its beautifully manicured grounds and outdoor memorials surround the shrine creating an aerial shape of a poppy – the symbolic flower commemorating the fallen of WWI. Explore the galleries and exhibitions within the shrine, set in a cathedral-like underground chamber. You’ll see photographs, uniforms, artworks and memorabilia of Australia’s military history. Don’t miss the Eternal Flame, a permanent gas flame representing eternal life. Escape the hustle and bustle of Federation Square and stop by Koorie Heritage Trust. Located in the Yarra Building in Federation Square, this non-profit center offers Melbourne’s deepest insight into the indigenous Koorie people through immersive galleries and exhibitions. Here you’ll find artifacts, artworks, photos and oral history and video recordings preserving the Koorie cultural heritage of Victoria. See their temporary exhibits on the ground floor gallery or explore their permanent collections on the top floor. If you’re lucky, you might catch one of their fascinating and educational events, hosted throughout the year. Take a short half hour tram ride from the CBD to St. Kilda, a popular day trip destination for bay side fun. 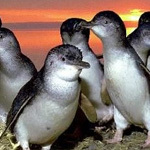 Noted for its beach and Coney Island-like theme parks, stay until sunset to view the St. Kilda fairy penguins return to their homes on the shore. The best way to view these tiny penguins is on the St. Kilda Pier, and don’t worry about what time of year to visit – you’ll see them year round. Further down the coast from St. Kilda is Brighton Beach, home of the iconic Brighton Beach Boxes. First built over a century ago, these historic bathing boxes remain unchanged. Their bright colors and uniform proportions create an undeniable sense of satisfaction – your eyes are just naturally drawn to them! Though the ride to Brighton Beach is not free, buying a one-day unlimited explorer pass is more than worth it. 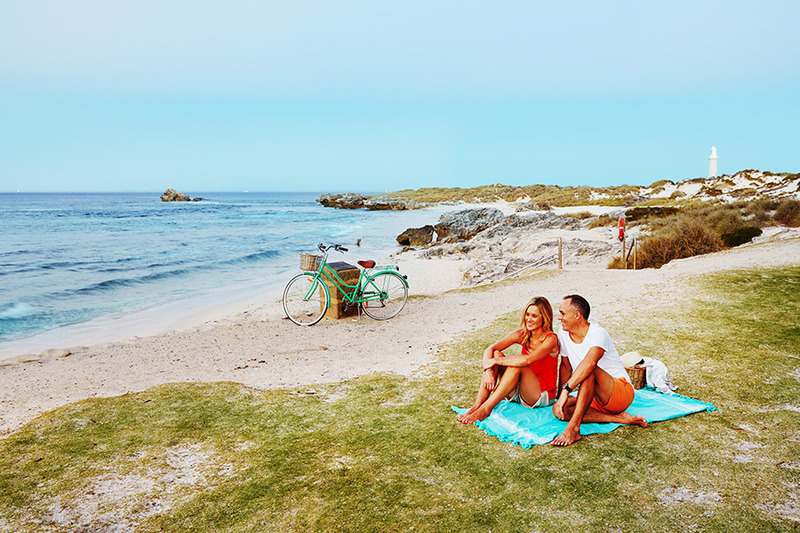 You’ll get to spend a sunny afternoon out on the gorgeous beach with discounts to other top Melbourne attractions. It doesn’t matter what time of the year you visit Melbourne – you’re bound to come across a festival! As Australia’s second largest city, Melbourne loves to celebrate its diversity with celebrations of music, food and culture. 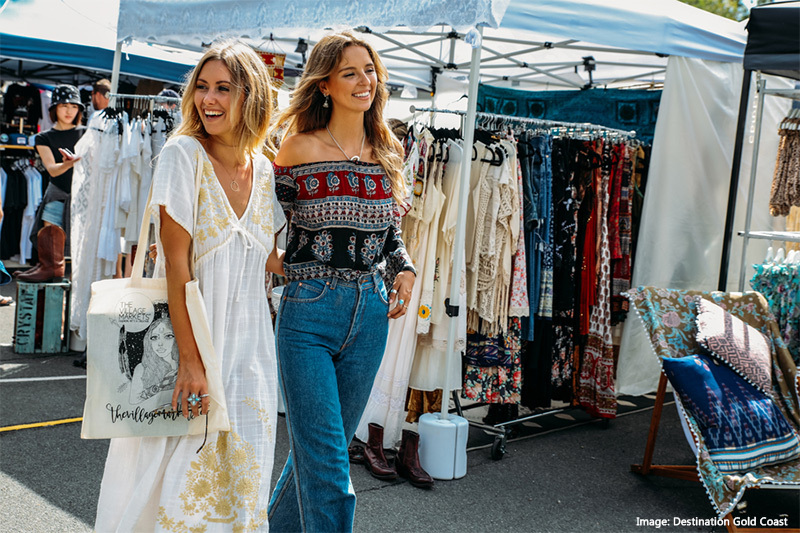 Step into Federation Square or the Queen Victoria Markets – where most of Melbourne’s festivals are held – and join in the fun. From Hispanic-Latin American culture of Johnston Street Festival to its Scandinavian Christmas Bazaar, there’s a festival for every culture in Melbourne. Catch the Chinese New Year Festival in February or the Diwali Indian Festival in October. See the night come to life in a spectacle of color and light during White Night in February, the most attended event of its kind in Australia. Moomba Festival in March is a flurry of color and spirit centered on the Yarra River with live music, parades, fireworks and carnivals. Music lovers can plan on dozens of festivals throughout the year. Melbourne Festival is a bucket list item, featuring major international artists. St. Kilda Festival, Australia’s largest free music festival, is also a popular favorite, bringing in some of the country’s top musical talents. Comedy fans will want to catch the Melbourne International Comedy Festival, one of the top three comedy festivals in the world. Ready to live it up in the city? 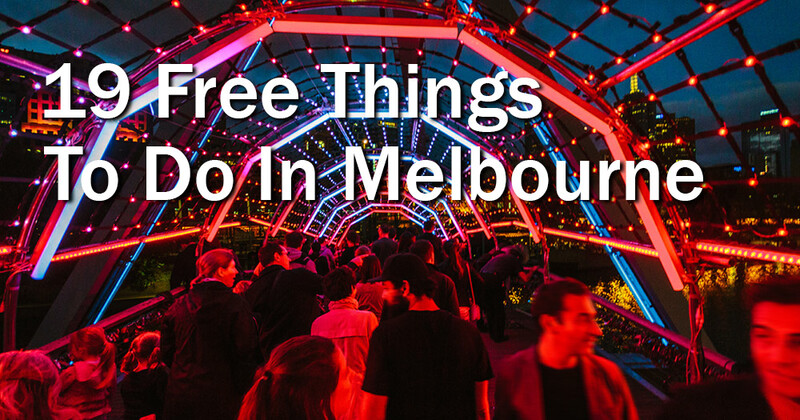 Whether you’re looking for a quiet afternoon getting lost in a museum or seeking a fun night out, the best thing about Melbourne is there’s always a way to do it for free. Fill your free days with these fantastic things to do in Melbourne and make your stay an unforgettable one. 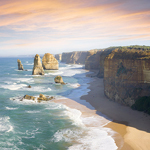 Want to add Melbourne to your Australia vacation? 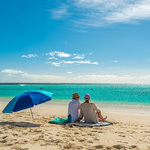 Let’s start planning your perfect vacation package – we’ll include time for you to truly get the most out of Melbourne. I Want to Go to Melbourne!